Latest Major League Baseball News! The Los Angeles Dodgers have signed free agent outfielder A.J. Pollock to a four-year contract that will guarantee him $55MM from 2019-22. The contract breakdown is a $12MM signing bonus followed by yearly salaries of $1MM, $12MM, $15MM, and $10MM. The contract also has an opt out clause after the third year as well as a player option for a fifth year or a buyout. If Pollock does not opt out after the third year and exercises his option for a fifth year then can earn $15MM if he reaches the required plate appearance and up to $20MM that year based off the prior years MVP results. If he declines the option he will receive a $5MM buyout on the option. Also if he is traded at any point he will receive a $1.5MM assignment bonus. So his contract is essentially for four years $55MM but can max out at five years and $70MM, it is ultimately Pollocks decision. Pollock, 31, was drafted in the first round of the 2009 draft by Arizona and spent his entire professional career in the Diamondbacks organization. Pollock has shown flashes of his potential but his biggest issue has always been staying healthy and on the field. He has spent a lot of time on the disabled list over his career with many different injuries ranging from hand to elbow to groin to last years broken thumb. All of these injuries are unrelated which is a good sign but at the same time all of these injuries have caused Pollock to miss a major amount of time. 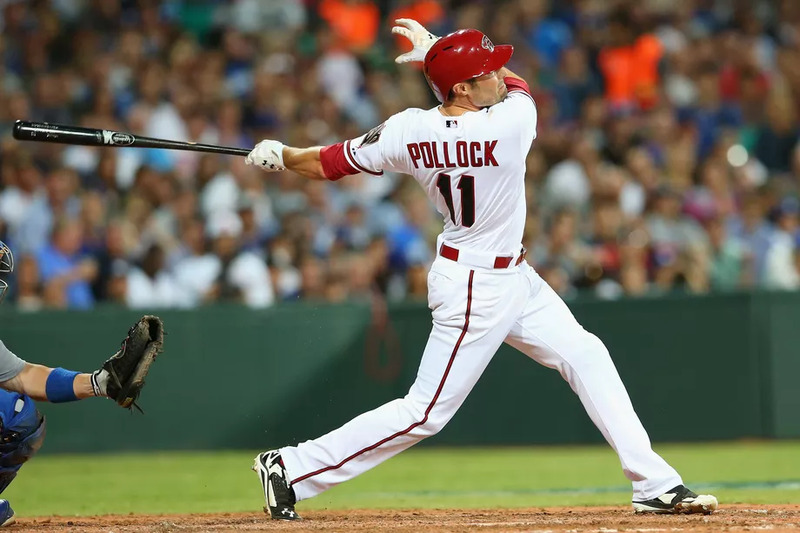 The one season that Pollock was able to appear in a career high 157 games was back in 2015 which saw him elected to the All-Star Game as well as earning a Gold Glove Award. During that 2015 season Pollock had a career high .315 batting average to go along with 20 home runs and also stole 39 bases out of 46 attempts. Last seasons broken thumb limited him to just 113 games for the Dbacks but he did show more power then before while connecting for a career high 21 home runs. If he can stay healthy it will be interesting to see what kind of numbers he can put up offensively as he is already viewed as a premium defender in the outfield. As for the Dodgers, they seemed to be clearing payroll space as well as outfield space earlier this off season when they shipped Yasiel Puig and Matt Kemp to the Reds. Some thought they could potentially be making a run at Bryce Harper but after the Pollock signing that appears unlikely. LA is known for playing the match up game instead of having guaranteed positions set in the outfield so it will be interesting to see what they do with Pollock who has appeared in 573 of his 594 games in center field. If they choose to make Pollock their everyday center fielder then they will use some combination of Joc Pederson, Cody Bellinger, Chris Taylor, Enrique Hernandez, and potentially Andrew Toles as well as top prospect Alex Verdugo at the corner positions. Of course there is always the possibility that LA makes more moves that could lead to a less cluttered outfield as they are still in talks with the Marlins regarding catcher J.T. Realmuto. But Pollock, as long as he is healthy, will definitely help balance out the Dodgers lineup as the majority of the players bat from the left side so he should be ticketed for regular time. Something tells me that the Dodgers are not done making moves this off season and the outfield mix may change by the time the regular season rolls around.